The Teen Advisory Group (TAG) is comprised of reading members responsible for nominating and selecting titles for The Trendy 12. Return your TAG order form by September 7th! What is TAG and how do I participate? TAG, which stands for Teen Advisory Group, is for students with a voracious appetite for reading. This group is responsible for reading 20 - 25 novels between September and March and for selecting the Trendy Twelve titles promoted across the district. This group will also plan and facilitate some extracurricular library activities associated with library programs and promoting reading to our PSMS community. TAG meets monthly during lunch from September to May. You may earn community service hours for this activity -- 1 hour for each meeting or event attended, and 2 hours for each TAG book read and reviewed. This group is best suited to serious readers who can make the commitment to reading 20-25 books rather quickly. In addition, you will be invited to the Chocolate Fountain Party in May to celebrate the Trendy 12. As a reader selector, you have the opportunity to help choose books for the Trendy Twelve List. The books are selected to provide quality reading for Prairie Star Middle School students as well other Blue Valley middle school students. With that in mind, there are a wide variety of tastes and interests. The Trendy Twelve is open to any PSMS student. The titles on the reader/selector list include a balance of reading genres, ages, and interest levels. Not all titles will be equally suitable for sixth grade participants. There are 21 books on our list with 4 additional books specific to PSMS. TAG titles are available at the PSMS library and at the Johnson County public library. Every vote affects the outcome, so it is very important that you read ALL the books on our list! Remember, you are not just reading for your personal taste but to select those books that will appeal to a wide variety of our students at PSMS and across the district. Upon completion of a service project, students may receive 1 hour for each meeting/event attended plus 2 hours for each TAG book read and reviewed on Canvas. Join Remind Join Remind! Students and Parents! NEW! 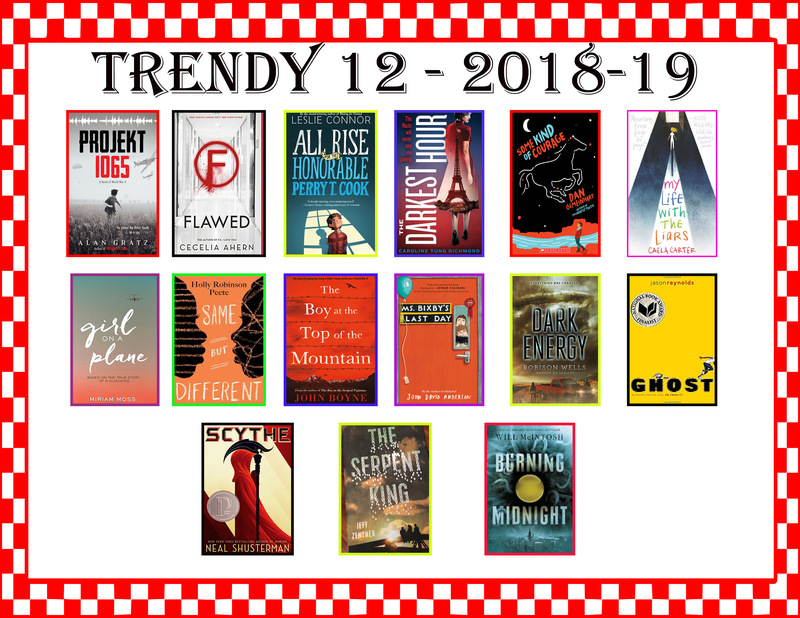 Trendy 12 for 2018-19! A TTT book should have lasting and universal appeal to teens between the ages of 12 and 18, not necessarily mass or popular appeal. It should keep readers' interest through personal, often emotional involvement with the book. A TTT book should also be memorable and worth reading again. Ideally, if you read the book ten years later, you would still like it as an adult. Packaging is important. The book's cover should catch your attention, draw you in, and relate to what is inside the book—no bait-and-switch covers. The summary on the back or flap should be accurate, helping potential readers to judge their interest in reading it. The book's size and format in hardcover or paperback should fit the content. A TTT book should be a "book of substance," not a "fluffy." Each book should be unique, not a clone of every other teen book. A TTT book offers a new perspective, a new way of thinking. A TTT book has characters who are similar in age to the reader, at least 12 years old and up—not too young to understand or experience teen problems and concerns. Characters are realistic and compelling. Readers relate personally to them. Even in fantasy or horror, characters should be true to themselves—acting the way they would act. Each character should be distinctive. A TTT book's subject matter applies to teens. If the story is about social issues that teens face, it should be realistic, not sugar-coated. Good descriptions help readers picture the setting; great imagery lets you feel as if you're there. A TTT book is never condescending to the reader. A TTT book has a strong, memorable plot that plays out in your head like a movie—imagining the events is effortless. You forget that the events didn't actually happen, even if you know realistically that they couldn't have (as in science fiction and fantasy). The book should have a good balance of action and description, with a satisfying ending—not necessarily happy. The TTT list should represent as many genres as possible, as well as a broad range of interests, containing something for all different types of teen readers (for example, not all realistic fiction). Nonfiction is well organized and covers an interesting topic, offering a fresh viewpoint. It must be accurate yet readable and concise. When appropriate, good illustrations support the writing.